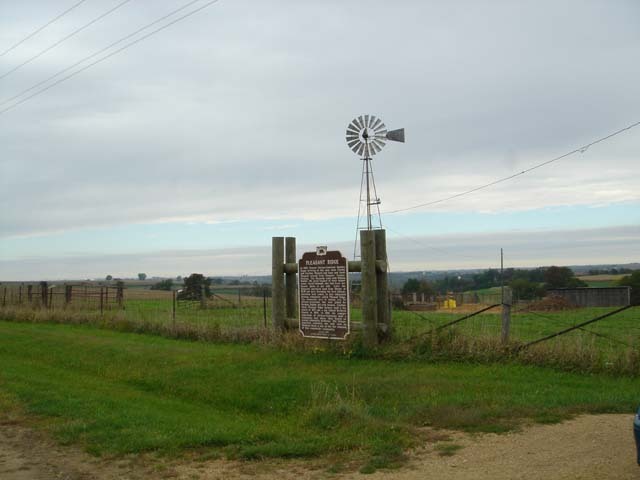 Located Highway 35/81 and intersection of Slabtown Rd.WI Coordinates Lat N 42:49':605" Lon W 90:47':702"
In 1850, Pioneer African~American families began arriving in this area when Charles and Caroline Shepard and Isaac and Sarah Shepard arrived from Fauquier County, Virginia. The Shepards came with William Horner, the great - nephew of their former owner, Sarah Edmonds, who had freed her former slaves in her will. 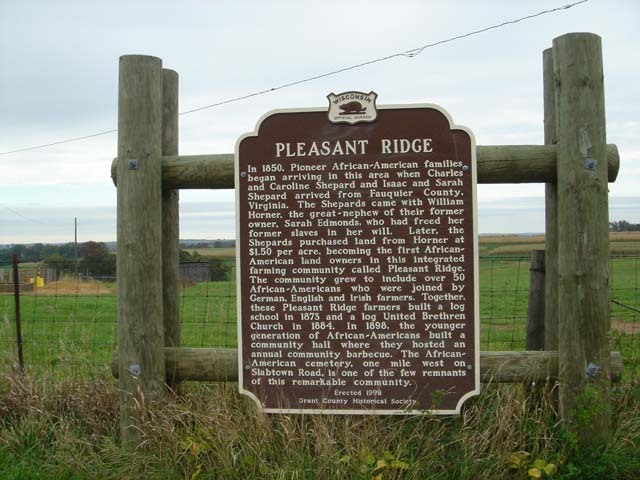 Later, the Shepards purchased land from Horner at $1.50 per acre, becoming the first African~ American land owners in this integrated farming community called Pleasant Ridge. The community grew to include over 50 African-Americans who were joined by German, English and Irish farmers. Together, these Pleasant Ridge farmers built a log school in 1873 and a log United Brethren Church in 1884. In 1898, the younger generation of African-Americans built a community hall where they hosted an an ual community barbecue. 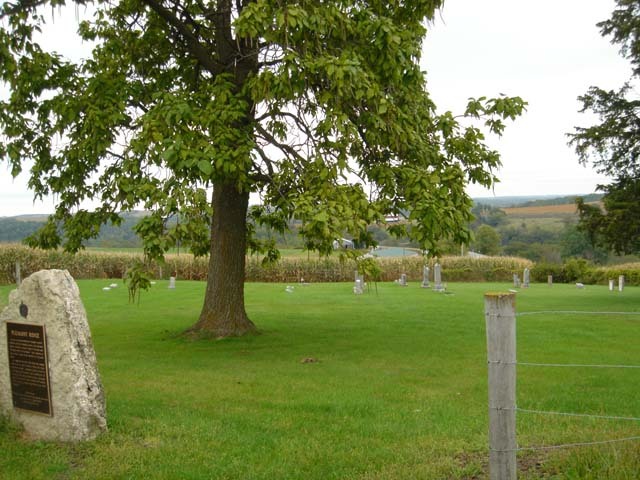 The African- American cemetery y, one mile west on, Slabtown Road, is one of the few remnants of this remarkable community. Coordinates Lat N 42:49':847" Lon W 90:48':799"
IN 1848, WILLIAM HORNER OF WARREN COUNTY, VIRGINIA AND HIS FORMER SLAVES, THE SHEPARD FAMILY, HITCHED A TEAM OF OXEN TO WAGONS AND VENTURED WEST TO WISCONSIN. 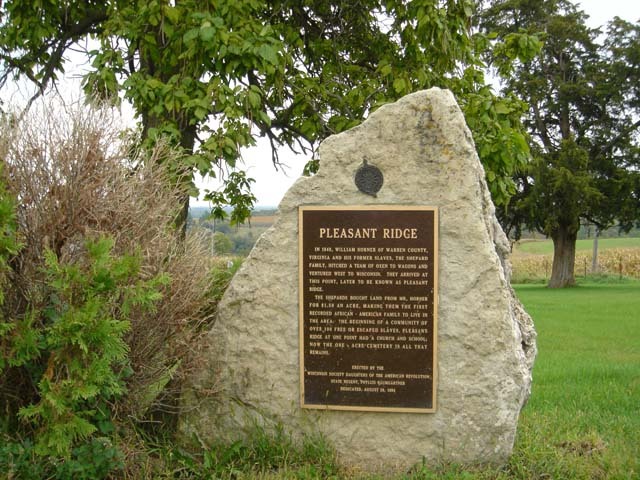 THEY ARRIVED AT THIS POINT, LATER TO BE KNOWN AS PLEASANT RIDGE. THE SHEPARDS BOUGHT LAND FROM MR. HORNER FOR $1.10 AN ACRE, MAKING THEM THE FIRST RECORDED AFRICAN • AMERICAN FAMILY TO LIVE IN THE AREA. THE BEGINNING OF: A COMMUNITY OF OVER 100 FREE OR ESCAPED SLAVES, PLEASANT RIDGE AT ONE POINT HAD A CHURCH AND SCHOOL; NOW THE ONE ACRE CEMETERY IS ALL THAT REMAINS.